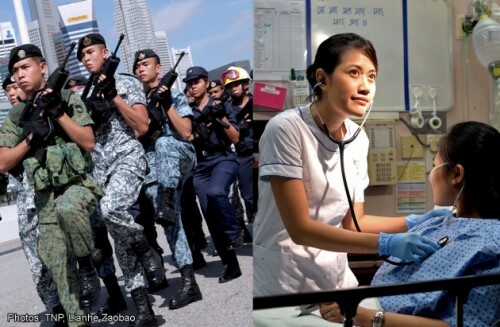 SINGAPORE - One groups keeps Singapore safe, while the other soothes its aches and ailments. There is a dire shortage of both. The Government is now digging into its pockets and offering higher pay to attract and retain both, Home Team officers and nurses. There will be hefty sign-on bonuses to attract Home Team recruits. Nurses in public health-care and other institutions supported by the Ministry of Health (MOH) could see pay hikes of between 5 and 20 per cent over the next two years. As for the officers, they could see their monthly salaries rise between 5 and 12 per cent - depending on which agencies they serve in - starting this month. Aspiring police officers can also look forward to bigger sign-on bonuses. Non-university graduates who are appointed police corporals and police sergeants from Aug 1 will receive $10,000 and $30,000, respectively, said the Ministry of Home Affairs (MHA) yesterday. These recruits will have to serve a bond of between two and three years, depending on their rank, said a ministry spokesman, who added that the police hope to hire 300 more officers by the end of the year. The Committee of Inquiry into the Dec 8 Little India riot had recommended beefing up the force. Those who join the Singapore Civil Defence Force, Singapore Prison Service and Central Narcotics Bureau as sergeants will receive a sign-on bonus of $10,000, said the ministry. Similar recruits with the Immigration and Checkpoints Authority will get $8,000. The 23,000 public-sector nurses will also get an additional half-month's annual bonus in addition to their pay hikes. Currently, enrolled nurses - the lowest tier and mainly graduates from the Institute of Technical Education - earn about $1,975 a month in public health-care institutions. Registered nurses with diploma qualifications earn about $2,500. "We hope that by enhancing their remuneration, we will signal greater recognition for this profession," said Health Minister Gan Kim Yong at the Nurses' Merit Award ceremony yesterday. He told the nurses: "I am not Santa Claus, but I think you deserve it." MOH estimates it will need an additional 1,400 nurses a year between now and 2020. Last year, the nursing population grew by only about 1,100. Senior, experienced nurses will also be given greater autonomy. This includes the authority to make some diagnoses or order certain medication and treatments.